Altogether for around 600 school children, 35 teacher and other staff members. 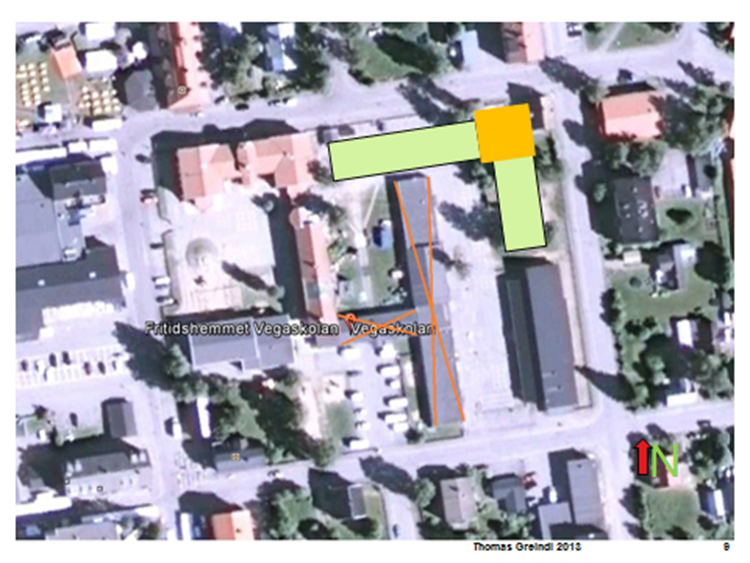 Area outside the Passive House boundary´s 310 m2. Number of levels above earth: 2 levels for school and teacher. One room for the ventilation units is in level 3. Source of energy for heating: District heating with renewable fuel, with only use of returning district heat water. Ceiling –mounted heating and cooling system. Radiant heating system is a comprehensive technology for realizing optimum comfort in the rooms with a simultaneous aesthetic integration in architectural room concepts. Radiant ceiling panels give off most of their heat through radiation. The remaining heat is transmitted via convection. The radiation of heat is achieved by passing heated water through pipes. The benefit of the system lies in the direct heating effect it has on the body, without the need to heat another medium for example air. Energy from the district heating system (returning water). Passive House certified central ventilation systems with heat recovery system and an effective heat recovery rate of 86%. 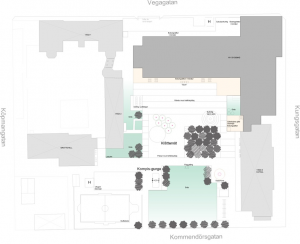 Date of construction/renovation: 3/2014 – 7/2015. Total cost: 10 000 000 € (90.000.000 SEK) project costs, building included all fixed equipment, school yard an external facilities. 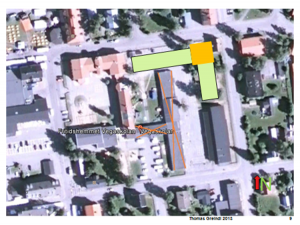 The Nya Vegaskolan in Vännäs will be built as passive house according to the international passive house criteria (PHI). 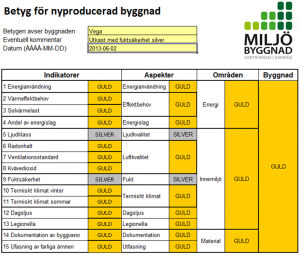 It will also be certified according to the sustainable certification system “Miljöbyggnad Guld”. This is so far unique for Sweden. The building envelope and insulation is 100% renewable materials, while the inner supporting system is armored concrete due to costs. 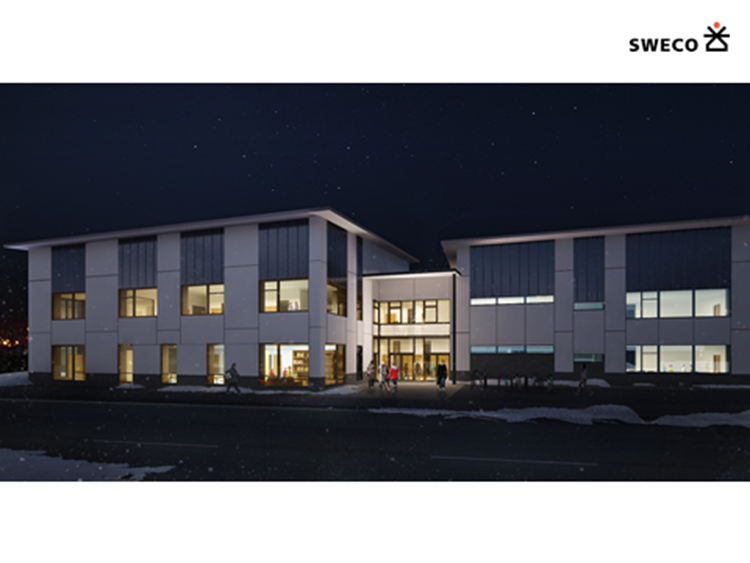 The building has 4260 m2 on two levels and will be used by 600 pupils and 35 teachers. The heat demand is 87% below building regulations and the total energy demand is 80% below the building code. Certification criteria for total specific primary energy demand is ≤ 120 kWh/(m²a), for heating ≤ 15 kWh/ms,a), Airtightness Pressure test result, n50≤ 0.6 h‾¹. All energy calculations have been done with the Passive House Planning Package (PHPP). Use of low-emission products is an important part of the project. The decision to build the new Vegaskolan as a model project for sustainable building was taken in 2012. The planning process started 2013, the same year the municipality agreed to follow the MountEE pilot project criteria. The construction will start fall 2014 and the building is expected to be completed late summer 2015. • Implementation of all policy decisions of the City Council taken in the context of sustainable living and building. • To Fulfill and implement the European targets of near-to-zero energy building for the years after 2018 for public buildings and 2020 for all buildings, already today. • To create a NZEB as far north as possible in Europe. • The design of a resource-effective building in all areas. • The reduction of CO₂ emissions plus achieving a negative CO₂ balance in the life cycle of 50 years. Vega school with the library will be located on municipal land in the middle of a major inner-city residential area mixed with a hotel and some shops for daily needs. The distance to the center is 200 meters. The new school replaces a damp damaged building which also contained asbestos-containing components and which has been located at the same place. There will be no new sealed surfaces. Through the new planning of the exterior surfaces ecological diversity and value of green plants is increasing. • Covered bicycle parking spaces are located at the main entrance. According to plans, continuously information exchange between MountEE and architect was provided. Under the hole planning process there were meetings every 2 weeks with the project-, building- and school management. All of them have been involved in the process regarding the overall concept, the floor plans, the function of the building and the selection of materials and equipment. A large display in the entrance area will show the current and the average annual energy consumption. Nenet is cooperating with the responsible architect Thomas Greindl and offering service and support following the structure of the service package. This means in practice that the standard is the same as in the service package regarding moduls 2-5. 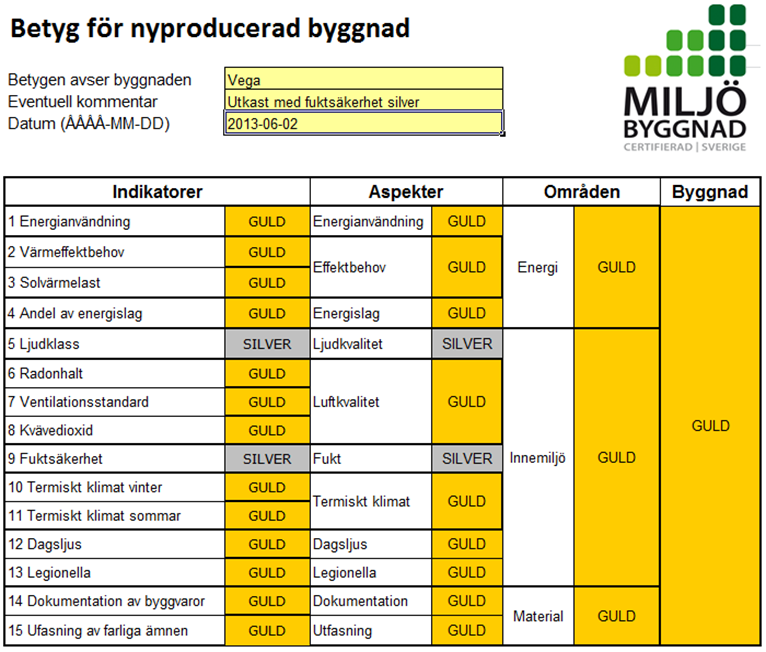 Certification as Miljöbyggnad Guld and passive house following PHI criteria secures a high level of quality. The primary energy demand includes the energy demand for heating, cooling, hot water, ventilation, auxiliary electricity, lighting and all other uses of electricity. The limits set above for the specific useful cooling demand and the primary energy demand apply for schools and buildings with similar utilization patterns. These values are to be used as a basis but may need to be adjusted according to building use. In individual cases where very high internal heat loads occur, these values may also be exceeded after consultation with the Passive House Institute. Proof of efficient electrical energy use is necessary in such cases. All energy calculations have been done with the Passive House Planning Package (PHPP) which is the key design tool used when planning a Passive House and as such, serves as the basis of verification for the Passive House Standard. There is no cooling demand because of the temporary exterior sun protection with external venetian blinds. They can be adjusted to almost any angle – comfortably from inside the room. Thus, the slats allow daylight to enter into the interior while still protecting visual privacy. As a heat shield in the summer and additional insulation in the winter, the external venetian blinds improve the energy balance of building. The adapted automated slat control ensures that external venetian blinds meet the requirements for energy efficiency class A. Optimum daylight utilization while minimizing heat input with the external venetian blinds the project benefit from significant cost and energy savings for artificial lighting and air conditioning. Additionally there is a bus-system that coordinate the sun shading systems, ventilation, heating, with each other to be able to react effectively to external weather influences. In addition there is an ice and a direction dependent wind monitoring. In the whole project we use demand controlled LED lights which daylight- and occupancy sensors which are cooperating with the exterior venetian blinds with concave light control slats. 1. Reduce the heating demand to around 15 kWh/(m2a) = intern. Passive house standard. 3. Avoidance of cooling demand through temporary sunshade systems, naturally night ventilation concept. 4. Reduce the use of electricity for artificial light, pumps and fans. 5. Reduce the use of hot water and the losses of the hot water circuit through extra thick insulation. 6. Use of the returning water of the district heating grid. 7. Use of district heating grid with a CHP system (combined heat and power coupling) and a PEF around 0,85. 8. Use of district heating grid which uses 90% biomass. District heating with renewable fuel, with only use of returning district heat water. For lighting: Certified Green Electricity. Not finally decided: a PV plant or a share in wind power plant. All energy calculations have been done with the Passive House Planning Package (PHPP). There is a space allocation plan for the project which also is used as a tabulation for all building materials. Part of PHPP is to take into account of all internal heat gains, passive solar gains, thermal bridges and more. Part of the planning process was to develop an air tightness concept with detailed drawings and material recommendations. There is also a training of construction workers as the airtight layer may be practiced. In any case there will be two Blower Door tests together with infrared thermography. To use HFC´s in the production process of XPS insolation under the ground slap. To use insolation panels with brominated flame retardants. To use PVC pipes for wastewater and conduits. To use refrigerants with ODP > 0 and GWP > 5 in cold storage systems. All chiller, freezer, cooler in the professional kitchen use as an environmentally friendly refrigerant CO2. All materials need an EPD, a sustainable certificate and a report for emissions. It is not allowed to use PVC pipes for wastewater and conduits. No floor coverings are used. Instead we use linoleum, wood parquet and tiles. Certified Passive House windows, doors and curtain walls are made of wooden frames with aluminum cladding. The exterior venetian blinds are made of aluminum. Ventilation pipes are made of galvanized sheet metal. The variety and numbers of materials were reduced and later on renewable, emission free building provisions produced as closed as possible to the building side were chosen. According to the joint evaluation guidelines and using interviews with the involved parties in the project as well as the continuous discussion of the project by the RCC.